Ken Baxter was a sensation in his first season with the Blues in 1938, when his eight goals in the second Semi Final against Geelong propelled the Blues into the Grand Final, and ultimately to our sixth Premiership. But after playing a big part in that long-awaited triumph, Baxter’s promising career was interrupted by three years of military service in World War II. In 1945, he returned home to re-establish himself as one of the Blues’ all-time great forwards, and celebrated flag success again in 1945 and 1947. In ten seasons at Princes Park, Baxter was a Premiership player three times, and club leading goal-kicker on six occasions. Although he often spent time in defence or in the ruck – particularly early in his career - he kicked seven or more goals in a match nine times, with a best effort of nine majors against Essendon at Princes Park in the last round of 1939. At the height of his career, Carlton supporters nick-named Baxter 'Fleetwood Smith' (after the Australian Test spin bowler) because of his knack of breaking at right-angles to kick goals over his shoulder. While he regularly missed seemingly easy attempts at goal, he was unerringly accurate with freakish snap shots. Baxter was recruited by Carlton from Werribee, where his acrobatic high marking and regular big bags of goals had attracted interest from a number of VFL clubs. He wasn’t overly tall at 183 cm, but his well–timed leap and strong hands made him tough to beat in any marking contest, and he had cat-like reflexes. He wore guernsey number 4 in his outstanding debut year, which was capped off by Carlton’s 15-point victory over arch-rival Collingwood in the 1938 Grand Final. When World War II erupted in Europe in September, 1939, Ken joined thousands of other young Australians in volunteering to serve his country. Playing at centre half-back, he was solid in Carlton’s ultimately unsuccessful 1941 finals campaign, before duty called and he began three years of active service. Thankfully, he came home unscathed in 1945, in time to play the last 13 matches of the year, and to contribute strongly to one of Carlton’s greatest Premiership wins. By mid-season of that last year of the war, Carlton sat ninth on the VFL ladder, and finals football seemed highly unlikely. But inspired by the legendary toughness and iron will of their captain Bob Chitty, the Blues won thirteen of their last fourteen matches to beat favourites South Melbourne in the most controversial and infamous flag decider of them all – the 1945 ‘Bloodbath’ Grand Final. Baxter was brilliant in that gruelling final series, remembered for two of the most vicious and spiteful VFL games ever played; the Preliminary Final against Collingwood, and the 28-point Grand Final victory over South Melbourne. Baxter was among Carlton’s best players on both occasions. Although his tally of five goals seems modest for a key forward, he was inspirational in simply refusing to be knocked off his game, while he ranged well up field to bring others around him into play. By round 14 of 1947, Baxter’s 42 goals had already wrapped up his third club goal-kicking award before he twisted a knee in Carlton’s narrow win over Richmond at Princes Park. The Blues went on to take out the minor Premiership, and firm into favouritism for another flag, while Ken went through a lengthy recovery process that seemed to have ended his season - until the eve of the Grand Final, when he and Allan Greenshields were named as the Blues’ two reserves for Carlton’s clash with Essendon. At three-quarter time in that hectic decider, only wayward kicking for goal by the Bombers kept Carlton in the match. Essendon (10.15) led Carlton (10.4) by nine points, and a boilover was brewing. Coach Percy Bentley took his injured champion defender Bert Deacon off the field and swung Baxter into the ruck, with immediate results. The Blues gradually clawed their way back into contention, but a couple of crucial misses, and desperate defence by the Bombers, had them still in front by five points deep into time-on in the last quarter. It was then that Blues captain Ern Henfry won the ball in the midfield, and kicked long to a contest at half-forward. The ball was rushed out of bounds, and thrown back in as the clock ticked into the last minute of the match. From the back, Baxter flung himself at the ball in the ruck contest, and knocked it into the path of rover Fred Stafford - whose neat left foot kick spun through the goals to give Carlton a last gasp victory by the smallest possible margin in a fairytale finish. Two years later, Carlton and Essendon met again in Baxter’s fourth and final Grand Final appearance. Fresh from another stellar 7-goal performance in the second Semi Final victory over North Melbourne, Ken took on the Bombers with confidence. But overall, his team couldn’t match a rampant Essendon outfit led by their emerging champion full-forward John Coleman, and Essendon blitzed the Blues by 73 points. 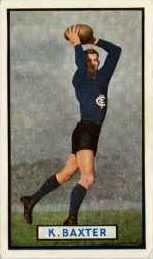 Baxter rounded off his fine career with Carlton when he won his fifth successive leading goal-kicker award in 1950. His 14 matches that year took his career total to 153, and culminated in a 12-point victory over South Melbourne at Princes Park in the last round of the season. Had he not missed three full seasons of football while serving his country in wartime, Ken Baxter would surely have played more than 200 games and kicked over 500 goals for the Old Dark Navy Blues. His induction into the Carlton Hall of Fame in 1998 was overdue and richly deserved. Sadly, Ken did not get long to enjoy the many accolades that continued to come his way after his career ended. On 27th April, 1959, he was making his way into the Melbourne Magistrates Court - to report for jury duty - when he collapsed and died of a brain aneurism, at the age of just 41. Ken Baxter won the 1937 Werribee Football Association's "Banner Trophy" for best and fairest in the competition. He tied for the award with another player, Ron Smith, who went to Essendon. 1939, Carlton were in Sydney to play N.S.W. July 29 on the Sydney Cricket Ground. The Sydney Morning Herald July 25, wrote about each Carlton player. K. Baxter, 21, 5ft. 11 1/2in. 12st. Plays at full forward, and is one of the highest marks in Victoria. Contributors to this page: Jarusa , molsey , Bombasheldon , blueycarlton , PatsFitztrick , camelboy , WillowBlue , pblue , keogh , true_blue24 , Juzz and admin . Page last modified on Wednesday 17 of May, 2017 21:39:54 AEST by Jarusa. 1992 Rd 8 - Pies Centenary Game: Ron Barassi reflects on rivalry.